In June 1984 a conference on visible and IR tunable solid-state lasers was held in La Jolla, California. 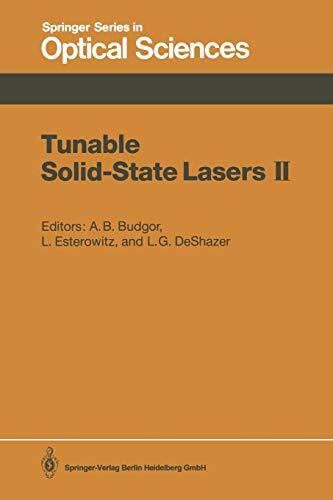 The proceedings were published as the first volume of this series, Tunable Solid State Lasers *. The emphasis of this meeting focused on discerning unified themes in the generic areas of: - Laser host/dopant identification and growth procedures, - Theoretical analysis to elucidate fundamental tunable laser principles, - Experimental investigations on laser spectroscopy to which theoretical analyses and models can be anchored, and - Auxiliary technology developments in efficient laser pumping sources (diodes, ftashlamps). Subsequent to the La Jolla conference, two topical meetings were held, co-sponsored by the Lasers and Electro-Optics Society of the Institute of Electrical and Electronics Engineers, and the Optical Society of America (OSA). The contents of Tunable Solid-State Lasers II comprise the pro­ ceedings of the second of these two, held at Rippling River Resort, Zigzag, Oregon, June 4-6, 1986. In addition to the four areas of attention in the La Jolla meeting, pa­ pers on color-center and new rare-earth lasers, and on nonlinear frequency shifting were also given. In a fashion similar to the previous meetings, the informal atmosphere of the conference and meeting site was conducive to constructive interaction among the attendees. A total of 54 papers were scheduled for presentation, 20 of which were invited and 34 contributed.